Women often ask me how they can dress themselves chic in winter? Well, I always answer that fashion is a very individual theme. Not every taste is the same and not every outfit fits to every woman. A winter outfit should not only be fashionable, but also keep warm. For this reason, a warm parka is absolutely recommendable (in my case the Woolrich Arctic Parka). Indeed such jacekts are very expensive. But in my opinion it is worth to pay this, because you can wear this high-quality parka a longer time and it is a timeless fashion item. Hunter rain boots fit very well with a Woolrich parka, because the boots are made 100% of caoutchouc and are very comfortable. But you should also wear thick socks to keep your feet warm. 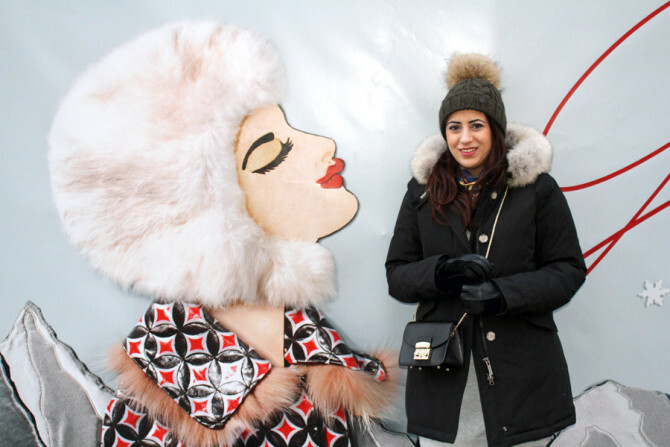 Last but not least a warm wool hat and thick fur gloves are necessary to be chic in winter. In this way you come safely through the winter :) You can find the links to the products at the end of the post. I wish you all a good start into this new year! You look adorable and I’m lovin your shiny black Wellingtons with black Tights.